Mystery, Audience Participation, Comedy, and MAGIC! The quality of Mak Magic's Strat-O-Sphere is unsurpassed, maybe never to be equaled. We provide a tall clear Plastic tube with metalic ends, which rests in a wooden base, a highly decorated Metal Tube and a Wooden Box, and three differently colored balls, each one 3 inches in diameter. A Red a Yellow & a Green ball that all match the metal tube color design! This color match is for patter possibilities. 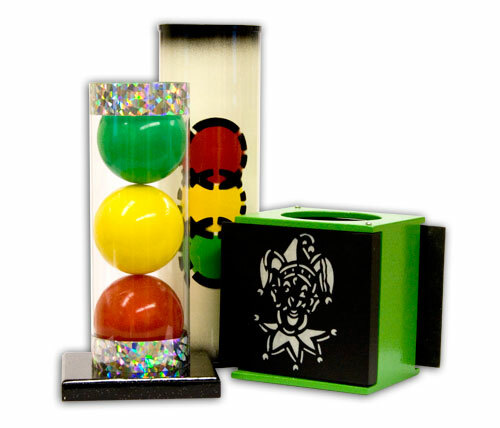 Although there is only enough room in the tube for the three balls, one on top of the other, the ball placed on top of the three magically appears on the bottom or in the center of the stack of three. The red one seems to be the ball that likes to do the wandering. Finally, the magician takes this roaming ball and places it in the wooden box. He grasps the box by the ends of the doors and flips it open. The ball has vanished! The audience sees completely thru the box. The ball reappears in the plastic tube between the other two. Manufactured with Class by Mak Magic.